This past Saturday morning, Kathie, Susan, and I joined Denny Connor's work party at Mazo Bluff. Denny has made great progress in opening up more of this nice prairie remnant, but there is still lots to do. The three of us were working down the side of the steep hill that faces east. The long-range goal is to get rid of all the trees and brush, at least on the upper part of this hill. Already, little bluestem is coming in where brush and trees had been cleared in previous years. But down the hill there was a forest of buckthorn! What we were dealing with was a literal forest of buckthorn resprouts. The explanation for the resprouts was that a group of Scouts had worked in the area in years past, but were reluctant (or forbidden) to use herbicide. 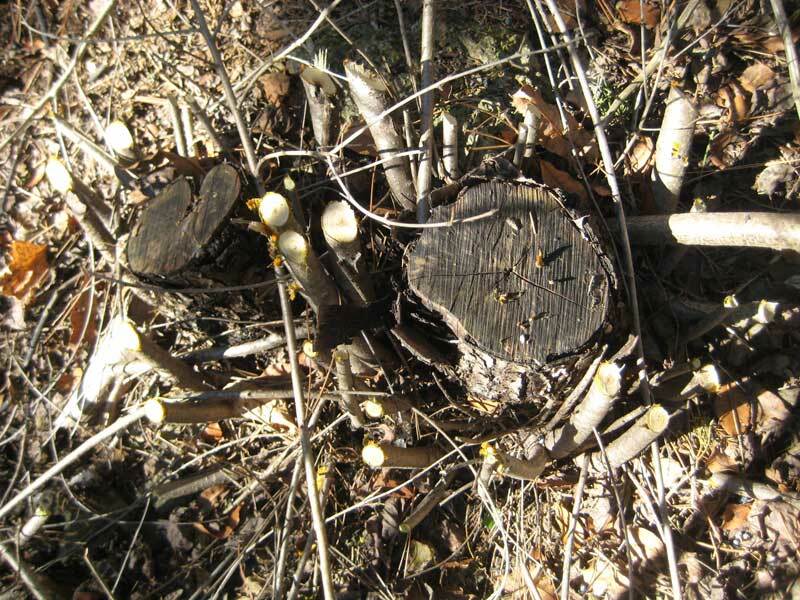 Yes, buckthorn does resprout when the cut stems are not treated. The cutting had been done quite a few years ago so that there has been plenty of time for new lengthy stems to develop. Take a look in Susan's photo below at the resprouts of these buckthorns. We counted as many as 25 stem resprouts from a single plant. In addition to these previously cut plants, the steep hillside below was a dense tangle of buckthorns, all fairly large and substantial. I was interested in seeing all these large buckthorns because we no longer have anything like this at Pleasant Valley Conservancy. It took me back to those days in 1999-2000 when we were clearing our south-facing slope. Not all prairie sites in our area have so much buckthorn. 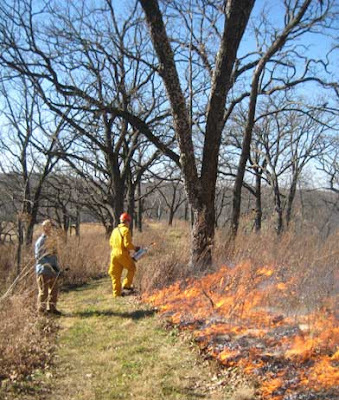 For instance, there is practically no buckthorn at Black Earth Rettenmund Prairie, and there wasn't much even before restoration work began. Why the difference? An important factor in this Driftless Area is the nature of the bedrock. Buckthorn is a strong calciphile, and only flourishes in higher pH, calcium-rich soils. As it happens, the bedrock at Mazo Bluff consists of Prairie du Chien dolomite, whereas the bedrock at Black Earth Rettenmund is Tunnel City sandstone, except for a tiny bit of Black Earth dolomite atop the knoll. For those who are interested in GIS, the reason I know the bedrock geology of these sites is that I have a shape file with all the Dane County bedrock formations, kindly sent to me by the Wisconsin Geological and Natural History Survey. I can overlay this file on top of the 2008 Dane County ortho-air photo, and the various formations (which are color-coded) line right up. An interesting study would be a buckthorn survey of all the hills in western Dane County, since some are dolomite and others are sandstone. Nice graduate student thesis! Seed collecting is an important part of our restoration activities, and this is the time of year when we are pulling together all of the collections. Kathie is in charge, and in addition to her own collecting activities, she spends a lot of time keeping track of the data. Our regular crew (Susan, Marci, and Amanda) have been doing most of the seed collecting and cleaning. I do a little collecting but mainly help with the hammer mill work and do all the computer work. This year we had 149 species of forbs, which is about our usual level of species diversity. Some of these species are only present in small amounts, whereas we have lots of others. I'll be entering the weights into the database sometime next week. The mixed seeds are bagged and hung in the barn until time to plant. We aren't planting any new areas this year, so most of the seeds will be used as "fill-in", in areas where we have eliminated invasive shrubs, woodland sunflower, and pale Indian plantain. (See earlier blogs for the story on the sunflower and plantain.) We won't actually plant most of these until after our spring burns are finished. Also, Kathie spends a lot of time putting aside species for other people. These are seeds that we donate in "trade" for the sweat equity that folks put into seed collecting here at Pleasant Valley Conservancy or in trade for species that are in short supply for us. In addition to seeds from Pleasant Valley Conservancy, we have another set of collections (45 species) made at and destined for Black Earth Rettenmund Prairie. These will be planted in brush-control areas after next spring's burn. 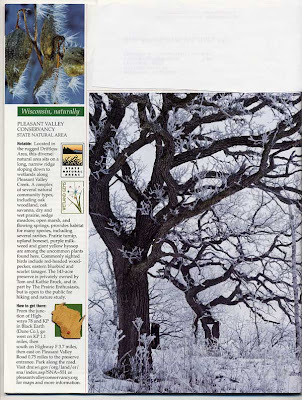 We were delighted to receive the December 2010 issue of Wisconsin Natural Resources and discover that our Pleasant Valley Conservancy was featured on the back cover of the magazine. A great photo of bur oaks rimed with hoarfrost graced the page. The photo was taken by Thomas Meyer, Natural Areas Conservation Biologist of the Bureau of Endangered Species. "I was out there last winter during one of those amazing hoar frost mornings. The frost crystals were an inch long in places, especially near the top of the ridge where the air was moving a bit more. The place was magical." If you don't know Wisconsin Natural Resources magazine, you should. Any environmentally focused Badger should subscribe. Published bimonthly, it covers all aspects of Wisconsin nature and wildlife. The quality of the magazine is shown by the fact that the staff received a prestigious award by the Madison Audubon Society at last year's banquet. Among other things, this coverage by the magazine emphasizes that Pleasant Valley Conservancy can be pleasurably visited any time of the year! Check us out. Yesterday our crew spent the whole day at Black Earth Rettenmund Prairie basal barking brush: sumac, grape, raspberries (mostly black), honeysuckle, buckthorn, gray dogwood. The weather was surprisingly fine and we made great progress. Part of the time we were working along a barbed wire fence line that reflected a long history of benign neglect. 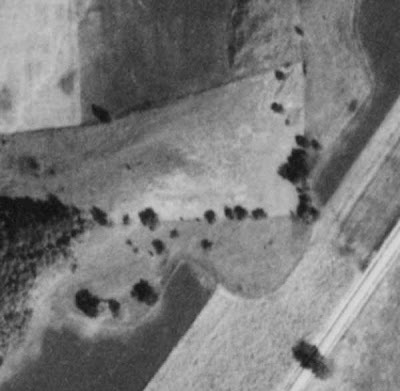 The photo below is cropped from a 1955 air photo, and shows the fence line clearly. The neighbor's pasture is to the left and the prairie is to the right. The invasion of woody vegetation is clearly seen. By the time the Nature Conservancy acquired this property, in 1986, the woody vegetation along the fence had become very dense. The first thing TNC did was to organize work parties to clear the fence line and other woody vegetation. As I described in an earlier post, the land "remembers" and most of the invasive shrubs that we deal with at Black Earth Rettenmund Prairie are concentrated in the former woody areas visible in the old air photos. This includes the fence lines. So yesterday a lot of our work was along the fence line shown in that 1955 air photo and in the photo to the left. Lots of brambles, grape, and sumac, among other species. Basal bark treatment (with Garlon 4 in bark oil) is ideal for this sort of area, especially with the relatively small-sized shrubs that we are now dealing with. The other technique, cut and treat, is difficult to do cleanly along fence lines. With basal bark, all you do is treat each individual stem and go on to the next. The herbicide is translocated downward, where any dormant buds and the roots are killed. The stems will all burn up in the prescribed burn we will be carrying out next spring. 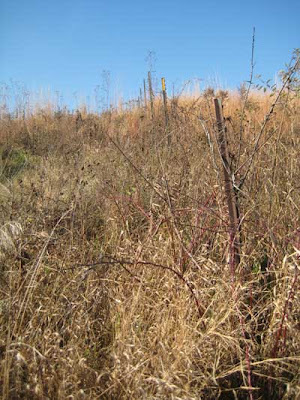 The only invasive shrubs we should see by summer will be those derived from the dormant seed bank. Eventually, this seed bank will be exhausted. Although we still have some problem shrub areas left, we are making great progress. A few more years and then...? For the past several weeks, whenever we can scare up some time from other tasks (such as seed collecting), we have been working on buckthorn control. This is a good time of year to do this, as buckthorn leaves remain green when all other plants have senesced and turned brown. 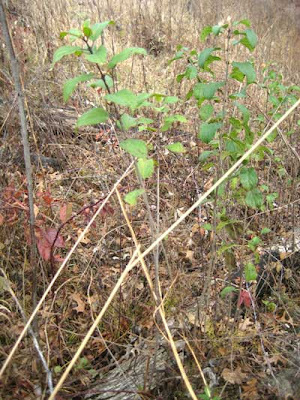 It is really easy to spot the occasional buckthorn plant mixed in with the good plants (see attached photo). This time of year our method of choice is basal bark treatment with Garlon 4 in bark oil. It is really too late in the year to rely on foliar control, since even though some buckthorn plants still have leaves, many do not. Basal bark treatment works on both kinds of stems. Our crew has been canvasing all areas where buckthorn is present. With the small stems we must deal with, the preferred method is squirting with a hand spray bottle, which permits precise placement of herbicide. (Depending on the terrain, the sponge stick can also be used.) The various stems in the plant are pulled back, revealing the bare stems at the base. In most cases, all stems can be sprayed at one time, with a couple of squirts. Then on to the next plant. We previously located major buckthorn patches with the Garmin, and created a map. This helps us considerably in making sure we don't miss any problem areas. 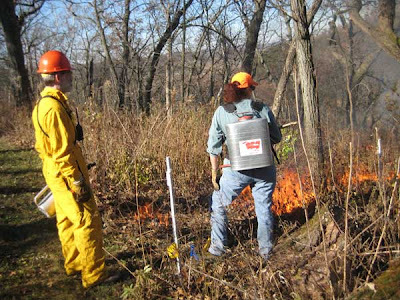 Our buckthorn density is now fairly low, so we can canvas an area fairly quickly. Most of our buckthorn areas are in the western end of the Conservancy, where the bedrock is dolomite (buckthorn is a calciphile). There are at least three periods of the year when we do buckthorn control. Late May after our spring burns, when we use backpack sprayers to treat small buckthorn resprouts with foliar Garlon 3A. Mid-October to mid-November (now) when we do basal bark with Garlon 4. Of course, basal bark can be done any time of the year, even winter, although it takes more skill in the winter to find the naked buckthorn stems. 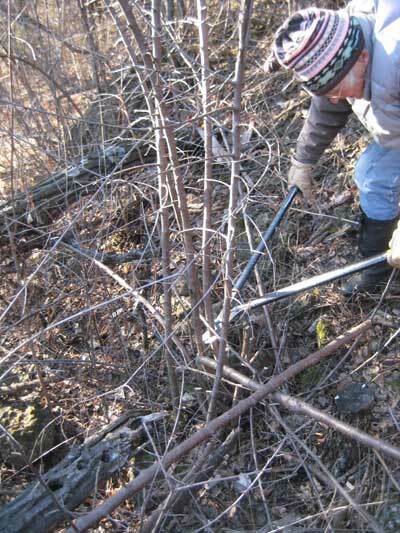 We are determined to eradicate buckthorn from our property. We have made great progress, but I figure it may take another three years to finish the job! 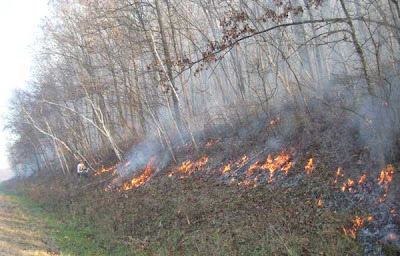 The weather finally cooperated and we were able to do the large burn of the north woods. Fall burns are tricky, because the days are short, the temperatures are lower, and the humidity is often high. The kinds of conditions we look for are what used to be called "Indian summer." These are unusually warm conditions that develop in the late fall after one or more hard freezes. The freezes cause plant senescence and bring the leaves down, and the warm sunny weather is generally accompanied by lower humidities. Fortunately, this week we had almost perfect Indian summer. We planned to burn about 25 of the 30 acres on our major north woods. However, due to fuel conditions, we could only get about 16 acres to burn well. The map at the bottom shows the area that actually burned. We had a long fire break along the top of the hill, stretching the whole length of the north woods. The plan was to back burn down into the woods. (County F at the bottom of the hill provided an excellent fire break on the north side.) We started lighting at the top of the hill in the middle of this fire break. This area was in the sun, so it burned well, as the photos here show. Once this whole line was blackened, we started down the hill into the woods itself. The east and west ends of the woods burned least well, because there were fewer trees and hence less oak leaves on the ground. 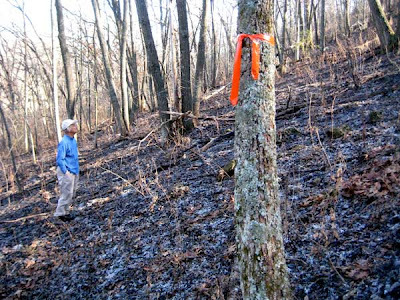 However, the major part of the woods in the middle has lots of large black and red oaks, and a substantial leaf litter. Most of the leaves had come down recently and hence were dry and curled up. Because of this, they carried a fire fairly well. Every available person with a drip torch worked on the side of the hill. For safety, they kept in touch by radio. It took about 2 hours to complete lighting the whole slope. The last area to be lighted was the road cut along County F. Because the leaf litter was fairly sparse here, it did not burn as well, although some areas burned quite well. (See Amanda working hard in the photo below). The whole burn was finished by 3 PM, after which Kathie and I checked the whole fire break for possible problems. Mostly the fire line was clear, but there were two snags on the north fire break that were smoking even though they had been cleared. One of these was well inside the burn unit, but the other one was right on the burn line. Kathie spent about 30 minutes dousing this snag with water, and managed to put it out. Next day, we had someone with a chain saw cut it apart and toss the pieces down the hill (well inside the burn unit). Kathie and I did a complete circuit of the burn unit the next day. 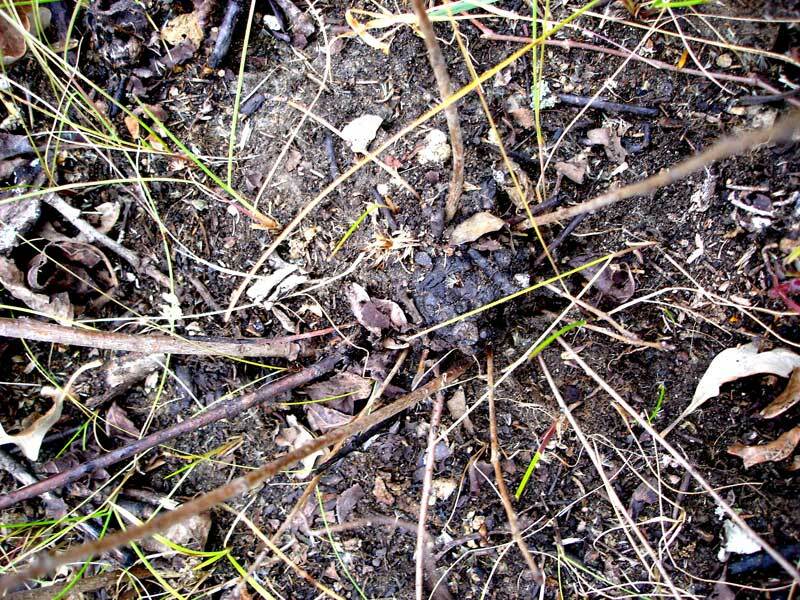 The middle of the burn unit was virtually 100% black, with only occasional small patches of unburned leaves here and there. Today I loaded the Track data from the Garmin into my computer and converted it in ArcMap into a polygon shape file. The results can be seen in red in the map below, which also includes the similar results in white from the 2008 burn of the same woods. 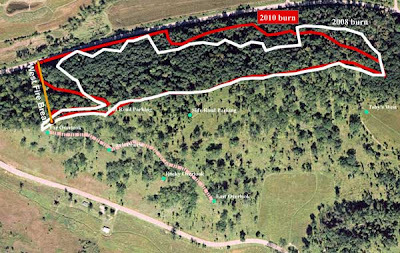 The area that actually burned, according to ArcMap, was 16 acres, which is about 64% of the whole burn unit. However, in the middle of the burn unit, the burn efficiency was closer to 100%. 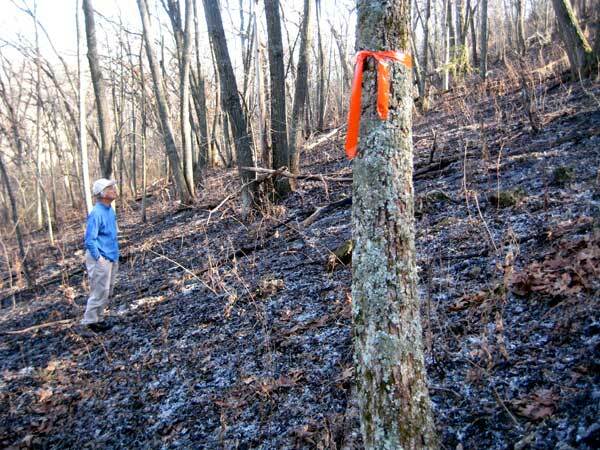 The burned area in 2008 was about 14 acres, somewhat less than this year. See my 2008 blog post for details on that burn. Nice day for killing sumac etc. We had a nice day at Black Earth Rettenmund Prairie killing sumac. Five volunteers spent three hours. Now that most of the clones have been knocked back, we are relying on basal bark treatment with Garlon 4 in oil. No need to cut anything. Kathie came up with a neat method for keeping track of who was working where. The upper part of each stem to be treated is bent at right angles, and then its base sprayed (using a hand spray bottle). The next person along will immediately know that that stem has been treated. Another advantage: If the stem is already dead, it will snap easily and the inside will not be green, indicating that that stem does not need to be treated. We'll keep doing sumac (on volunteer work parties and with our Savanna Oak Foundation crew) from now until the snow comes. If there is no snow, we'll keep going all winter (or until all the sumac is treated). We know that next spring we will have to spray the new sumac root suckers that have arisen from the extensive rhizome network. We are planning on eradicating sumac at this prairie via a three-year project. In addition to sumac, we also treated the scattered buckthorns and honeysuckles. There are really not too many of these left. Also, we basal barked every grape vine we found. Grab a part of the vine, and then walk back toward the center of the colony while pulling on the stem. Spray all the stems arising from that colony. This works fairly well, although some of the vines are 10-15 feet long! We ended the day with 20 minutes of seed collecting (heath aster, the last species of the year). The weather was sunny and reasonably warm. Coats came off quickly. I was at the top of our ridge Tuesday and got a good look at what the beavers are doing to our wetland. 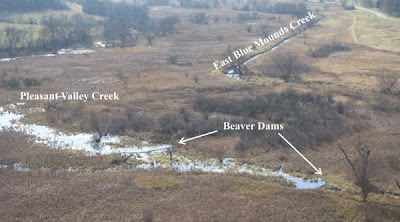 Their two dams along Pleasant Valley Creek are quite visible from the photo. The lower dam is about 100 feet upstream from the boardwalk. The larger dam, at the mouth of the creek near County F has been removed (again!) by a backhoe, and so far has not been replaced. We have had beavers off and on at Pleasant Valley Creek for years, but this is the first time they have been so far downstream. Muskrats have also built a house just upstream from the boardwalk, but they rarely do any significant damage.